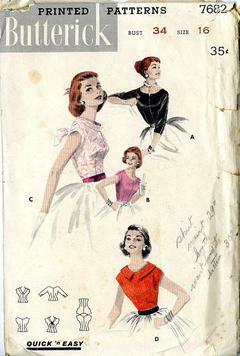 1956 Butterick #7682 vintage sewing pattern, misses' quick and easy blouse, neckline variations, size 16. A. blouse has deeply scooped neckline and cut-in-one, below-elbow sleeves. B. cap sleeves. C. shallow, cuffed neckline dips and ties in back. D. flat, wide collar on scooped neckline. Vintage patterns, sewing notions, books and booklets, craft kits and so much more!